A seclection of connectors for the 8mm and 10mm led strip lights. No Soldering needed These are all clip on type connectors for joining strip lights back together and also connecting DC sockets to strip lights. 10mm Strip to DC connector for the 5050 type strip lights. If you cut the strip this allows you..
10mm strip light clip on connector for joining strip lights 5050 type strips.To use just open th..
10mm strip to strip light connector with wire for joining the 5050 10mm type strips together. ..
1x 5.5mm DC male or Female connector with screw terminals on the back so you can easily connect ..
8mm Strip to DC connector for the 3528 type strip lights. If you cut the strip this allows you to pl..
1x clip on connector for joining the 8mm 3528 SMD strip lights together. ..
8mm strip to strip light connector with 15cm wireThis is used for joining the 3528 led strips ba..
You are buying one solderless 90 deg bend for either the RGB colour change strip light or the single..
1x Led strip light switch. Plug one end in to the strip and the other in to the power suppl.. If you are wanting to connect more than 5m of strip light together you will need one of these to go ..
10mm RGB strip light clip on connector. 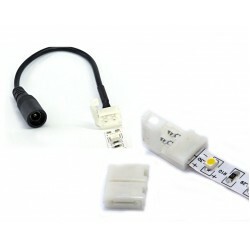 For the 5050 type RGB lights, (excluding the chasing lights)..
RGB strip light connector - strip to strip with 15cm wireUsed to join RGB strips together. ..
You are buyone one Solderless T joiner for the 5050 type led strip lights. Simply insert th..